I enjoy chatting with my readers. Since not every question or comment is relevant to a specific post, I offer this way for you to ask a question or make a comment privately and directly to me. Thanks for reading! I wanted to watch birds–maybe take a photo, or ten–but the birds weren’t interested. I’d heard them when I was inside, so came outside to watch. The birds absconded from my garden. They retired from their aerial runway for that evening. 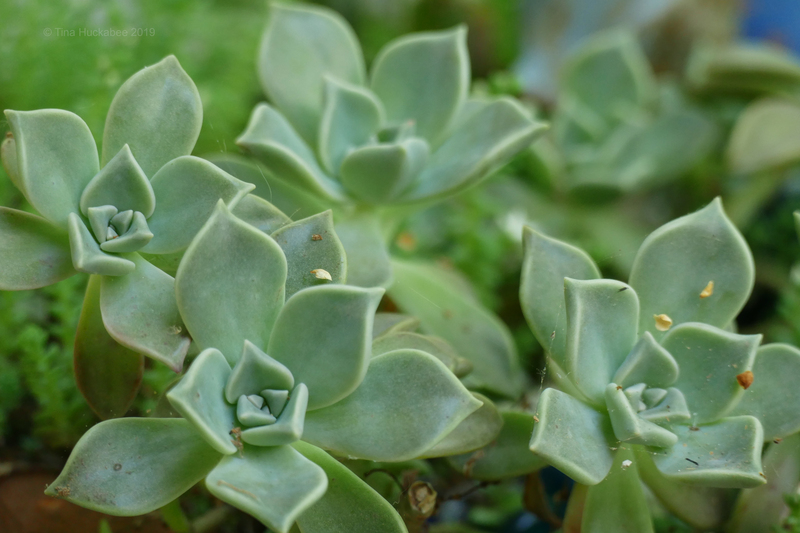 As I sat, photographically dejected, I observed this Ghost plant, Graptopetalum paraguayense, charming rosettes all cheery and eager for attention, just a few feet away. There’s something pure spring about the green of this plant. As I was pondering the lack of spring bird migration (that’s been a thing this year), I was rewarded with the company of these lush, friendly, spring-like plants. Interestingly, Ghost plants show a range of coloring–green, to grey, to tinged with pink–depending upon sun exposure and time of year. I grow quite a few ghosts, popped thoughtlessly in various pots around my garden; they’re stupidly easy to grow. This crew sits in morning sun and next to a bench–the bench where I watch birds. Or is it the bench where I appreciate ghosts? Today, I’m joining in with Anna’s Wednesday Vignette for springtime, and all kinds, of musings. Contact me with a question.